Andrew Flintoff has been sacked as England vice-captain and was also banned for the must-win game against Canada for breaching team discipline. He was reprimanded amid reports he fell off a pedalo and got into difficulties in the water in the early hours of Saturday, after England had lost. There were numerous reports stating he had been drinking heavily. 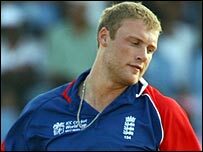 A Flintoff statement said: "I know what I did was completely wrong and I have to take full responsbility for it." The 29-year-old continued: "There can be no excuses on my part. I know I shouldn't have done what I did and I have to accept the punishment." Flintoff is expected to be reinstated for Saturday's final group match against Kenya, and vowed to make amends for his misdemeanour. "To my team-mates and the England supporters that I let down, all I can say is that I am extremely sorry and assure everyone that I will be giving 110% for England for the rest of this tournament," he said. Five players were also fined after they were seen out late following the defeat by New Zealand on Friday. They were bowlers James Anderson, Liam Plunkett and Jon Lewis, batsman Ian Bell and wicket-keeper Paul Nixon - who went to a nightclub after the game in St Lucia on Friday. Coach Duncan Fletcher said Flintoff would not be considered for the captaincy should Michael Vaughan get injured in the World Cup. He said in a statement: "Andrew Flintoff has been given warnings about his conduct and disciplined for previous incidents of this nature. "All players involved wish to express their sincere regret for the embarrassment caused to their team-mates, the England supporters and the ECB." Former captain Nasser Hussain felt the England management team had no other option but to make an example of Flintoff. He said: "This is a pretty young side. A lot of the team look up to Flintoff and if you keep saying it's okay for Freddie they will think "If he is doing it, I can do it". "This will now send a message to the others that this is not how you prepare as an England cricketer. Footballers don't drink 48 hours before a match. "The management felt enough is enough. At some stage you have to have some strong management, even with your best cricketer. "Well done England for finally for having some strong management." But former captain Ian Botham felt too much had been made of the incident. "I think it's an over-reaction. "Did people complain in 2005 when we won the Ashes? Some people go to bed at 10.30pm tired, other people like to go for a drink." Several supporters had sent e-mails to British newspapers saying they had seen the players at Rumours nightclub. Those newspapers then got in touch with the team management who felt they had to react. The fines were handed out following a team meeting on Saturday and Flintoff did not travel to the venue for the match against Canada, which started about 30 hours after the pedalo incident.